Well here we are in the last few days of autumn (although it feels like its been winter all month). I received my Bundle Monster plates in the mail yesterday and was rather excited to use them. The problem with so many plates is choosing which design to use. Ozotic - unnamed vintage bottle (circ 2002) green/gold duochrome. 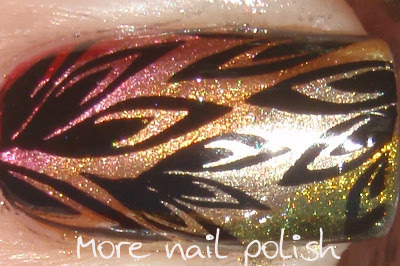 Here is a close up of a nail so you can see the five coloured strips beneath the stamping. 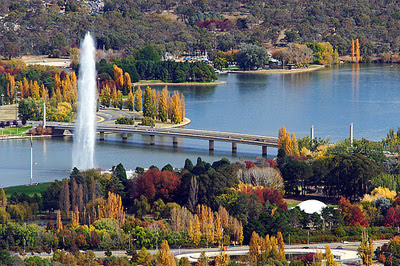 Here is my inspiration for this design, Canberra in autumn. Isn't it just beautiful. so beautiful!!! love the gradient and all blend in so well! love the colors and the stamp design came out really good! You have captured the colors of your inspiration so well! Such a stunning manicure!!! Wooow! How pretty combination of colors! :DThis mani looks fantastic! Oh gosh, gorgeous! I love it, and the photo of Canberra. I can't wait for fall, here in the northern hemisphere summer is coming fast for us! 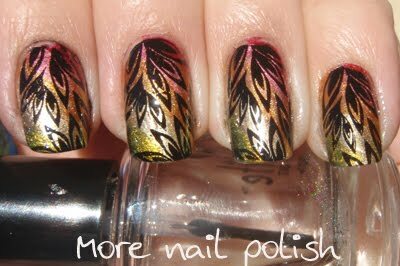 This mani is so original and beautiful! That mani is the embodiment of Autumn. Thank you all for your comments. I really loved this mani, it just came together out of nothing and was so pretty. I was thinking of doing a tutorial, but I really don't think it needs one. All I did was a diagonal line of each of the listed colours, then stamped. I can't believe how blended it ended up looking. Wow, it does look so blended. I didn't even realize it was just diagonal lines... the colors flow so great!